A little puzzled by some of the negative reviews. I have found these three distortion plugins to be fantatsic at giving really satisfying character. While they can all totally blitz a sound, they also have a less tiring and more satsifyinglt natural chaos about their sound than pretty much all other stomp box emulations I've tried. I have used many distortion plugins, but none come close to these. This is insane! This is a great little collection from UA. The TS808 is beautiful however a little intense. I find that it almost muddies the tone a bit when slapped on pre-amp. You definitely need to tweak the settings alot and scale them down to get usable overdrive. However - when you do - you get AMAZING tone. This is way better than all of the other non-DSP ones I've tried. This SOUNDS analog, it sounds real - however intense it may be. There's everything from slightly Crunchy to heavily distorted. Especially nice when used as unison plugins in combination with the clean sound of Softube Vintage Amp Room in "Brown" mode! These pedal plugins are exceptional and worth every penny, especially the Raw or The Tube Screamer into the Engl Classic amp or the Friedman Dirty Shirley amp plug gives the screaming metal tone of a hardware TS 808 into a Marshall-style master volume amp. I'll never mic another amp in the studio! This plugin is by far the most authentic digital substitute to the real thing! I doubt even an experienced guitarist could hear the difference. Finally happy with DI guitar recording!! As a songwriter I've always been searching for ways to simplify the process of capturing an idea and shaping a song. I've never been happy with DI guitar until discovering these plugins. All 3 of these sound fantastic, and I'm getting better sounding distortion on these than mic'ing my amp. Plus, it's so convenient to be able to quickly dial in a tone in Console 2.0 and not have to deal with setting up my amp. I still prefer the sound of my own Tube Screamer in my Fender DeVille, but it's nice to be able to record guitars at anytime of the day and actually end up with useable tracks without having to re-amp/mess with the amp later. I've been using these on the demo for a few days, now. There is no way that I can't buy them. The Big Muff is such a dirty little beast. I ran these all through the ENGL on a clean setting. The virtual Rat sounds better than my newer Rat II. The filter taper and sound are a little smoother. Probably means I should just solder a better transistor in mine. I have a 90's Russian Big Muff and the Bermuda behaves a lot like it. Rolling off the guitar volume works the same on both. The Bermuda is a little darker but my actual pedal has always been too bright. I've never been a fan of tube screamers so I don't have much of a critical opinion about this one. This model sounds decent. Still not a fan of tube screamers. Just the fact that the Unison tech works on the HI-Z input as well makes me put a plugin-pedal in front of the guitar, even though it may be turned off for clean sounds. 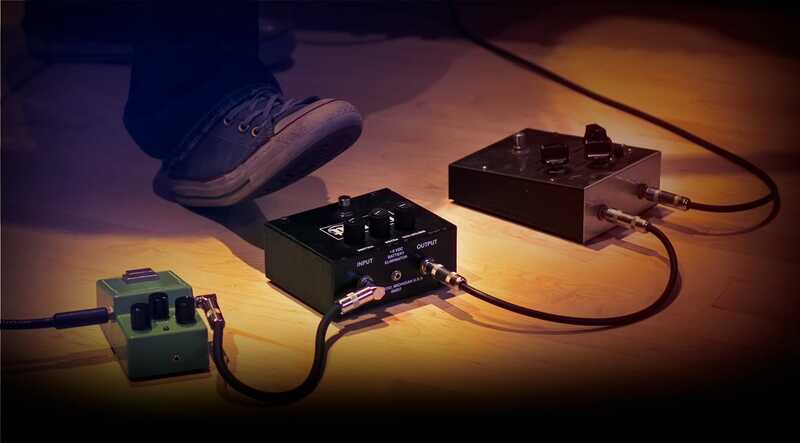 I can´t really comment on the authenticity of the Bermuda and Tubescreamer as I´ve never owned them, but I really enjoy the sound of them, the Tubescreamer does pretty much everything I need with the Vintage Amp Room. I can however comment on the RAW pedal. I owned a RAT some 15 years ago, and I could never get a sound out of it that I could use for anything. When I slapped the RAW into the recording chain, I was immediately taken back to the rehearsal room. It sounds just like I remember it, and I can´t get any sounds out of this that I can use. Great emulation! Taking into the fact that until now I have not found a tube amp simulator that sounds much like a real amplifer, and I mean that is not tinted harsh and digital sound; these three plugins of famous pedals sound very well and are realistic, but as I said you have to have a clean guitar sound base, which has to be very good and realistic, and yet I have not found it among the many guitar simulators on the market. And I do not speak of highly distorted sounds that could be good enough, but of a clean, round, full sound and tube guitar. Another thing is the price that is too high at least for one of the non-professional musicians like me who like much but the sounds of Universal Audio. I pretty much exclusively use pedals on drums, vocals and synths and these have just rocked my world. My reamps and DIs are now sitting redundant as I pound beats and textures with the RAW especially. I've always loved the RAT and this just gets me there straight away. Couldn't be happier!! I don't have a random setup at all. I have a Apollo quad and a satilitte octo. All through thunderbolt into a Mac Pro. I work on very big projects. It's very common for my sessions to have 80 tracks or more. I have other plugin bundles from other companies that I use from time to time to lighten the load. I always find the UA plugs far superior. I really can't get over the sound of the stomp boxes. I have a 5 of the top amp in my studio, and I really don't think I will be using them much longer. I already sold one stack. Buy a satilitte you won't regret it. It really is just a waste of money if you ask me. They don't sound nothing like the real thing and it just really plasticy. UAD is all I use !!! These sound awesome. I never thought I would say I wouldn't use my amps any longer, but its starting to look that way. Stop complaining about DSP power. If you want the best sound, you have to pay a little for it. Thats why I know have 12 DSP processors. The new upgrades RULE !!! I have to say, that in spite of the few negative reviews submitted early on, and maybe because I did not use the previous console very much before the new one arrived, having only recently acquired an Apollo Twin, I find the console V8 intuitive and a powerful asset in my setup and love these old faithful emulations of the distortion essentials plugins.. Yes I could always do with more plug in power, but I can still do a great deal with what I have and enjoy saving sessions for future use in an environment that looks attractive and functions at least for me, very well. I like also for instance, the fact that I can easy click decide what will go to track and what will just enhance the experience in the cans on the way in. the update is even better! they've rebranded these from when they first released it. and i think they tweaked it too. the Raw distortion plugin is probably the best RAT equation i've ever heard. and had many people who've been in the studio say the same. Get it and have unlimited RATs! I nice boundle to complete the sounds for the amps plugins, very usuable!.